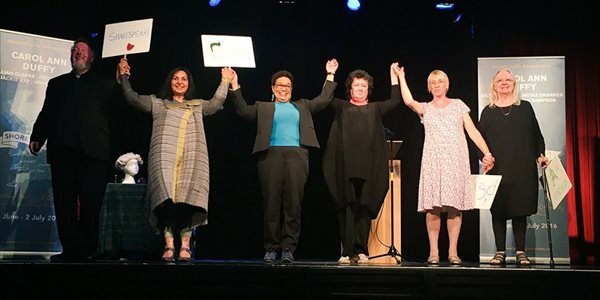 Carol Ann Duffy and her merry band of poets are currently in the middle of their Shore To Shore tour of the UK. We went along to take a look behind the scenes. Carol Ann Duffy and her merry band of poets are currently in the middle of their Shore To Shore tour of the UK. We went along to take a look behind the scenes of the poet laureate's celebration of poetry and community. For tour dates and tickets for Shore To Shore visit www.carolannduffyandfriends.com. Receive a handpicked weekly poem to ease you into the weekend. Sign up for our Friday poem email.